A fine selection of roses which can be delivered the same day by a local florist. All of our same day flowers and same day roses are ready for delivery the same day. Our network of florists will hand deliver the bouquet on your behalf to save you the trouble of searching around for the perfect bouquet. Same day flowers to be delivered is simple and welcomed surprise for the recipient. Hand delivered roses made simple with iFlorist. Our collection of beautiful fresh florist delivered roses are available for delivery throughout the UK. 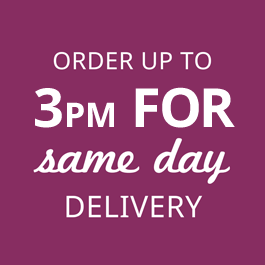 Simply order online and we'll do the rest, allocating your online flower order to one of our network of local florists and flower shops, with many bouquets being available for same day delivery. Hand delivered by one of our local florists, you can rest assured that your hand crafted rose bouquet will be lovingly created by one of our skilled florists before being delivered in a professional and timely manner anywhere in the UK.